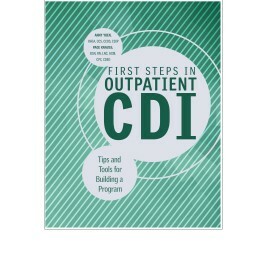 Find best practices and helpful advice for getting started in outpatient CDI with First Steps in Outpatient CDI: Tips and Tools for Building a Program. This first-of-its-kind book provides an overview of what outpatient CDI entails, covers industry guidance and standards for outpatient documentation, reviews the duties of outpatient CDI specialists, and examines how to obtain backing from leadership. Accurate documentation is important not just for code assignment, but also for a variety of quality and reimbursement concerns. In the past decade, outpatient visits increased by 44% while hospital visits decreased by nearly 20%, according to the Medicare Payment Advisory Commission. However, just because physicians are outside the hospital walls doesn’t mean they’re free from documentation challenges. For these reasons, CDI programs are offering their assistance to physician practices, ambulatory surgical centers, and even emergency rooms. This book will explore those opportunities and take a look at how others are expanding their record review efforts in the outpatient world. Anny P. Yuen, RHIA, CCS, CCDS, CDIP, is a health information management (HIM) and clinical documentation improvement (CDI) professional with extensive experience in healthcare and revenue cycle consulting. Yuen serves as the VP of revenue cycle for R3 Health Solutions. She is an active member of the American Health Information Management Association (AHIMA), the Association of Clinical Documentation Improvement Specialists, and the Philadelphia/Southern New Jersey local ACDIS chapter. Yuen coauthored The Complete Guide to CDI Management. She holds a Bachelor of Science degree in HIM from Temple University, where she minored in business, and is an AHIMA-approved ICD-10-CM/PCS trainer. Page Knauss, BSN, RN, LNC, ACM, CPC, CDEO, works as an outpatient CDI specialist. As part of the CDI team, she performs medical record reviews for PQRS and educates providers on everything outpatient including RAF, HCCs, MIPS, MACRA, and ACOs.